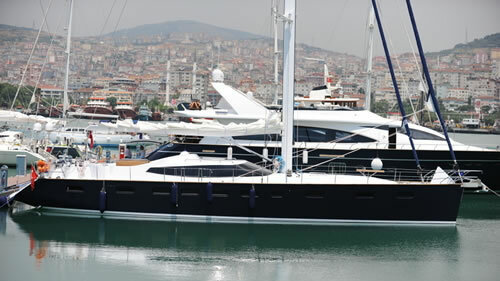 Would you like to charter the sailing yacht MUSTO? The comfortable cockpit on Deck has 2 tables that accommodate 12 guests total (6 each) and 2 separate steering helms with easy access. On the front Deck there is a hidden Jacuzzi with hydraulic opening that accommodates 4 adults. Entrance to crew's quarters is also from the front Deck. The yacht offers a luxurious interior design in teak and comfortable leather seating. You can enjoy spectacular views while having dinner or lunch from the panoramic windows at the upper saloon. The centerline passageway leads to the guests cabins. Operating expenses paid by the Charterer. Provisioning for guests & crew, fuel for motoring, land arrangements, airport transfers, and fuel for water sports. All purchases are fully itemized for client review. All additional expenses after the A.P.A. are the sole responsibility of the charterer. • Boarding time is usually 15:00 on arrival day and disembarkation on the final day is 10:00. • Credit cards, traveler checks and personal checks are not accepted for deposit, final payment and extras.